You'll be £15.00 closer to your next £10.00 credit when you purchase Rebel With a Cause. What's this? One hundred years on, it is hard to imagine the violent disruption caused by the suffragette movement. After a century of peaceful protest had brought no progress a small group of determined women took matters into their own hands and turned to direct action. By virtue of their actions the cry ‘Votes for Women’ was heard throughout the country. One of these unlikely ‘vandals’ was a mature middle-class spinster called Sarah Benett. After leaving home on the death of her parents, she spent a decade attempting to improve deprived workers’ conditions in the Staffordshire potteries. Realising that nothing could be achieved until women obtained the vote and could compete with men on equal terms, she moved to London aged 55. Disowned by her family she joined Mrs Pankhurst’s Women’s Social and Political union and became an active suffragette. Ahead of her lay verbal and physical abuse, public contempt, imprisonment and hunger strikes. Rebel with a Cause is her extraordinary story told largely in her own words. Gradually the remarkable stories of those women who refused to bow to the expectations of Victorian and Edwardian patriarchy are emerging. Sarah Bennett kept a diary and her family hold an unpublished memoir. These form the backbone of an enjoyable and informative book. I have so enjoyed reading Iain Gordon's previous historical books and Rebel with a Cause definitely doesn't disappoint. As always, the subject matter is researched meticulously and is full of interest. Sarah Benett was a remarkable lady, who despite her age, immersed herself totally in the fight for women's suffrage and telling the story through her own words made it seem even more relevant. This book is about Sarah, but it also encompasses the wider story of the vote for women and all the characters involved. This book is relevant to both the academic who wishes to study the subject, or to someone like myself who has read it for interest. I thought I knew the story about the Suffragettes, but I realise that I had only skimmed the surface and I found myself being totally absorbed by the Author's wide-ranging facts. I have therefore gained a new understanding of the subject. It isn't often that I say this, but you MUST read this book and if you are like me, you will not want to put it down until it is finished. A compelling and definite must read. 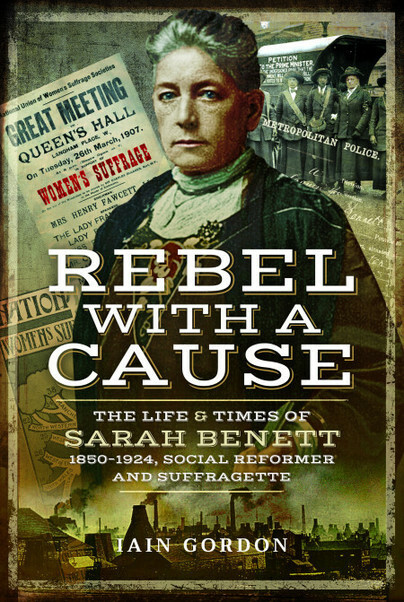 This is an extraordinary book that tells the story of Sarah Benett, who was one of the most unlikely militant suffragette’s, before joined the cause she was working tirelessly in the Staffordshire Potteries trying to improve the workers conditions, trying to get them the rights they deserved but unfortunately unless women had equality and more immortal the right to vote her actions came to naught. At the age of 57, Sarah Benett became a Suffragette. I have read so much about the Suffragette’s and what they went through to be able to put that cross on the ballot paper, but this has brought a whole new understanding and even further respect to those brave and wonderful women who gave their all for something that many women today do take for granted and we truly are indebted to them. Iain Gordan has written an informative, brilliantly researched and compelling book that can be read and enjoyed by anyone who has an interest in the subject. His writing is powerful, thoughtful and sympathetic to the subject as well as illuminating and engaging especially with the addition of the brilliant illustrations and photographs that really work to bring the time and this woman to life. This is definite must read, I cannot recommend it highly enough. Iain Gordon (pseudonym) is an experienced historical author. His Soldier of the Raj was published by Pen and Sword in 2001. He now lives near Barnstable, Devon.